A QDRO is a “Qualified Domestic Relations Order”, a specialized court order used to divide retirement accounts governed under Federal ERISA law. While the term “QDRO” technically only applies to ERISA governed plans, the term “QDRO” is commonly used among family law attorneys and litigators when discussing the division of any retirement account. From a technical standpoint, court orders that divide non-ERISA plans are properly termed as ‘DROs’ or ‘domestic relations orders’ or they may have their own special terms which apply such as ‘COAP’ (court orders acceptable for processing), ‘MDO’ (military division order), ‘Equitable Division Orders’, “408(d)(6) Order’ (division of IRA accounts), or other terminology. The various terms are not as important to understand as the underlying purpose of the specialized court orders-which is essentially the same no matter what the terminology-these orders are specialized court orders used to divide a retirement accounts pursuant to divorce or legal separation. Can my attorney just do it for me? Can I just hire a paralegal to do it for me? Do I really need a QDRO Attorney? The reason the profession of a QDRO attorney exists is because of the technical nuances and traps for the unwary between different retirement accounts. You would not have your general doctor who you see for the flu do brain surgery on you. It’s the same for QDROs. It’s very risky to have a family law attorney or paralegal prepare your QDRO, because the technical differences between how different retirement accounts function. If your judgment says your ex is to receive half the community property in your retirement account, the QDRO must be drafted differently for CalPERS, CalSTRS, Union, Military, 401(k), ERISA Pension Plan, Non-qualified plan, ect. Gains on separate property interests, proper allocation of loan transactions against 401(k)s, survivor benefit elections in the event of death, and other technical rules can make a big difference if not properly addressed. While your family law attorney or a paralegal may have the capability to navigate the court system, they may or may not have the proper knowledge to navigate the various retirement traps that apply to your retirement account. At a minimum, you may want a QDRO attorney to review and give you an opinion of the QDRO that has been drafted for you, if you have already hired your family law attorney or a paralegal to draft a QDRO for you. Railroad-Railroad Tier II benefits are governed by federal Rail Road law. They require special language in the divorce judgment or a separately prepared division order. Railroad Tier I benefits are the railroad’s version of social security and do not require a division order. A former spouse’s entitlement to Railroad Tier I benefits generally follows the same rules as derivative social security benefits. PERS-CalPERs plans are governed by the California Government Code and are almost always divided by separate court order from the divorce decree. Clients should be wary of the differences between the ‘separate interest’ vs ‘shared interest’ options and know the ramifications between choosing one over the other. While a shared interest division order can later be replaced by a separate interest order or superseding shared interest with gillmore election division order, separate interest division orders are irrevocable once the division process is completed by CalPERS. Military Retirement System (Pension)-Military Pensions require very specialized knowledge and are perhaps the most complex retirement accounts of all the various retirement accounts. A family law attorney or paralegal should never prepare a military division order without the assistance of an expert. The National Defense Act of 2017, the Howell vs Howell Case (2017), and the blended retirement system-which went into effect January 1, 2018, all added a layer of complexity on top of an already complex area of law. Military Pensions can be divided in a family law judgment or by separate court order, but an expert on military benefits should always be brought in to consult on the proper language. The Military has regulations in place that allow for the Military pay offices to ‘reinterpret’ the plain language of state court orders-parties should be extremely wary about dividing these accounts without proper expert advice. 401k-All 401K accounts are governed by ERISA and require QDROs to be divided. Parties should not wait to complete their QDROs for 401k accounts. Since these accounts are ‘portable’ the employee spouse can roll over these accounts to IRA accounts or even cash them out. Further the employee spouse has complete control over the investment decisions of the funds inside the 401(k) account. A non-employee spouse should always get their QDROs completed for 401(k) accounts right away. Can I pick how I receive my money? Yes-but the options on how to receive your money will depend on the type of account that is being divided. Some plans allow for lump sum payment options (401(k)s and most other defined contribution accounts) and some do not allow for lump sum distributions-they only allow for monthly payments (most traditional defined benefit plans-i.e. pension plans). Do I have to wait for the ex spouse to retire? This depends on the type of retirement account. For 401(k), defined contribution accounts, and most ERISA pension plans-no you do not have to wait for your ex to retire. For most governmental pension plans (Military, FERS, OCERS, and others) you have to wait if account segregation is not an option. Keep in mind, Gillmore rights are still available to the non-employee spouse where account segregation is not an option. What if my ex-spouse does not sign the proposed order? While most parties cooperate with the QDRO/DRO process, occasionally, an ex-spouse wants to be difficult and just doesn’t cooperate or sign the QDRO/DRO. In most cases-the QDRO/DRO can be filed anyway with a declaration regarding efforts to work with the difficult party. However, some judges will require a fully noticed motion-meaning you have to go back to Court to get the QDRO/DRO filed if your ex decides not to sign. Who pays for the QDRO? Who pays for the QDRO depends on your court orders. In about half the cases our office is hired on, both parties split the fees. In the other half of cases we are retained on, one party pays all the QDRO fees. In many cases, the court orders require the fees be split but one party still refuses. In some instances, an ‘equalization provision’ can be added to the QDRO to get the cooperative spouse reimbursed for 1/2 of the fees, if the non-employee spouse ends up paying all the QDRO fees due to noncooperation of the other party. Do I have to provide any documents? Do-Advise the QDRO attorney about pre-marital interest, loans, elective service credit purchases. Don’t-Assume your pre-marital interest will be accounted for if you don’t let the QDRO attorney know about it. Do-Advise the QDRO attorney if you are planning on retiring soon. Don’t-Wait until right before you want to retire to start on the QDRO process and expect your QDRO will be completed in time for your desired retirement date. Do-Advise the QDRO attorney if you are interested in cashing out money for XYZ purpose. Don’t-open escrow on an house and expect that you will receive your money from a QDRO in time for closing. Do-Advise the QDRO attorney if there is a restraining order or you want to keep your e-mail/phone/address private from your ex. Don’t-Assume the QDRO attorney knows about your retraining order or other special circumstances regarding the history of your case. 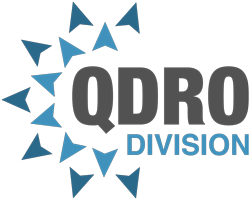 Do-contact the QDRO attorney to get the QDRO process started. Don’t-assume the QDRO attorney has been notified about appointment as the QDRO attorney from your family law attorney or the Court. How long is the QDRO process going to take? • 2-4 Weeks to draft the QDRO/DRO-assuming all the information the QDRO Attorney has requested has been provided by the parties. • 4 Weeks to obtain signatures from both parties (typically). Once signatures are received the QDRO/DROs are sent to court. • 2-4 Months for the Plan Administrator to process the QDRO/DRO. Some take longer-up to 8-10 months. I have bills to pay. Can I cash out my interest in my former spouse’s 401(k)/403(b)/457(b) Plan via QDRO? If I cash out my interest and I am under the age of 59 ½ will I have to pay the 10% federal tax penalty I have heard about? No. Under Internal Revenue Code 72(t)(2)(c) QDRO payments are an exception to the normal penalty rules. Will I have to pay any taxes on the money? Yes. You must pay ordinary taxes based on your own personal tax bracket. The Plan Administrator will withhold 20% of the funds payable to you for estimated taxes. Your actual taxes will be determined after you file your tax return. Depending on your own personal income tax bracket, the 20% may be an overestimate or underestimate-resulting in a refund or additional tax liability. Can I do a partial cash out? I don’t want to cash out the entire account. Yes. Once you cash out your portion of the funds, you will have to roll over the portion you would like to keep tax deferred within 60 days into another tax deferred account, such as a traditional IRA. This is a hard deadline by the IRS. You should consult with a financial advisor and make sure you have all the accounts lined up before you start this process. I am the account holder. Can I cash out my interest via QDRO and avoid the 10% penalties? Yes and No. You cannot ‘pay yourself’ via the QDRO process, however, if your former spouse is cooperative, you can award your former spouse more than he/she is entitled to under the judgment, with a promise that your former spouse return that money to you, less the tax liability. Can I cash out my interest from my former spouse’s Individual Retirement Account (IRA) and avoid the 10% federal tax penalty? No. under Internal Revenue Code 72(t)(3)(A) the QDRO tax exception does not apply to IRA accounts. Talk to your CPA to find out if other exceptions apply, such as the first time homebuyers or higher education expense exceptions.